Welcome to the House of Usher, where not everything is as it seems and you may find yourself buried alive if you’re not careful. The Fall of the House of Usher, a compact, macabre one act adapted from the Edgar Allan Poe short story by director Sean Graney and produced by The Hypocrites, is all delicious style and atmosphere. Every element has been designed to create a delirious world of over-the-top 19th century Gothic melodrama. 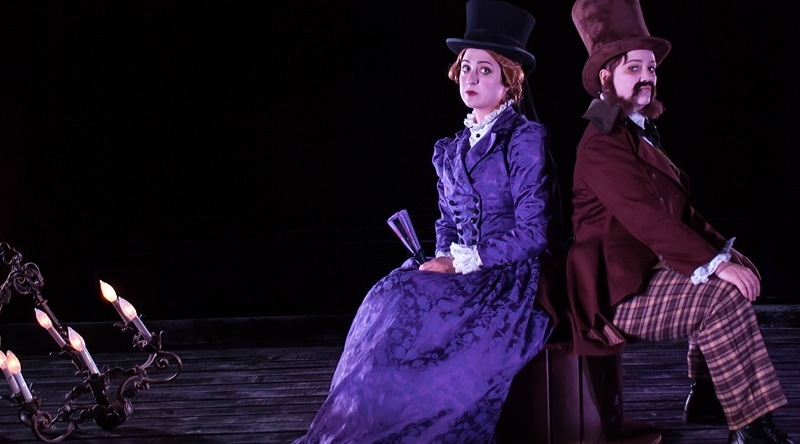 In other words, the scenic, lighting and costume designers (Joey Wade, Jared Moore and Alison Siple, respectively) all have their work cut out for them — and, for the most part, they deliver.